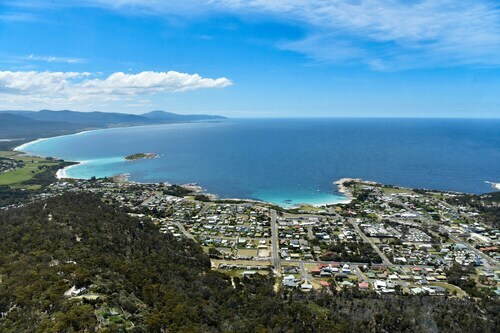 Located on the eastern coast of Tasmania, Bicheno is known for its incredibly idyllic beaches, mild climate, and fishing industry. Charming and picturesque, Bicheno is a popular place for people of all ages to enjoy a relaxing vacation. There is lots of good Bicheno accommodation for a comfortable home away from home as well as great facilities, amenities, and services for visitors. Previously called Waubs Harbour, the town was renamed after a prominent person in the area during the times of British colonialism. The former name was in memory of a young Aboriginal girl who was stolen from her family and then went on to perform heroic acts. Take a fishing trip with experienced locals to catch a variety of fish and seafood; the waters are home to scallops, crayfish, abalone, trevally, and more. If you just want to look at a range of marine life rather than catching it, there are two nice aquariums in the town. The lovely beaches offer swimming, paddling, sunbathing, and surfing. The famous world champion swimmer Shane Gould comes from Bicheno and you can pay a visit to the museum that proudly displays all of his glorious medals. The nearby Diamond Island is home to a penguin colony and it is a very popular daytrip from the town. You can visit the grave of Wauba Debar, the Aboriginal girl that the town was first named after. Not far from Bicheno is the fabulous Freycinet coast only a half hour drive away, where you can take a walk to admire Wine Glass Bay and Coles Bay in the beautiful Freycinet National Park, or sample some incredible wine from the Freycinet Vineyards. You can easily find all the essential items in a variety of shops throughout the town. There is a well-stocked supermarket, pharmacy, bakery, newsagents and more. There is also a good selection of places to eat and drink to cater to the many holiday-makers. Just a two and a half hours’ drive away from both Hobart and Launceston, you can book a cheap flight to Hobart or arrange a great deal on a flight to Launceston. As well as excellent flights we also have a great selection of hotels in Bicheno so take a break in this amazing region. How Much is a Hotel Room in Bicheno? 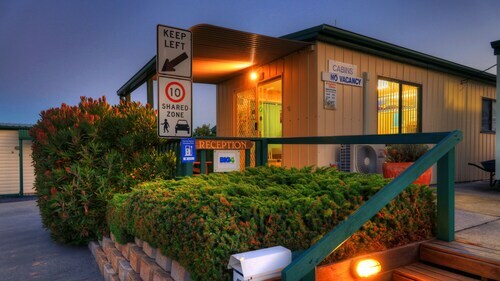 Hotels in Bicheno start at AU$70 per night. Prices and availability subject to change. Additional terms may apply. Stayed in the Queen en-suite room which is above-&-over anything I would expect from a ‘backpackers.’ Room is small - no need for it to be bigger - & very clean, with a small TV & good heater & private bathroom which was large, modern & clean. Shared facilities were ample with a lounge & kitchen with everything one may need. This room (& a couple of others) are in a separate location but it is no more than 30 seconds away in the car after collecting keys & being informed of relevant information at reception. Close to everything in Bicheno (but bear in mind everything in Bicheno shuts early - which, of course, reception advised.) Great price (especially compared to other Bicheno offerings) & good location for visiting Coles Bay & exploring Freycinet National Park. Loved the decor of the cabin and the spacious rooms. Liked the location, quality etc Didn't like that the beds were not made. Parking was tight too.